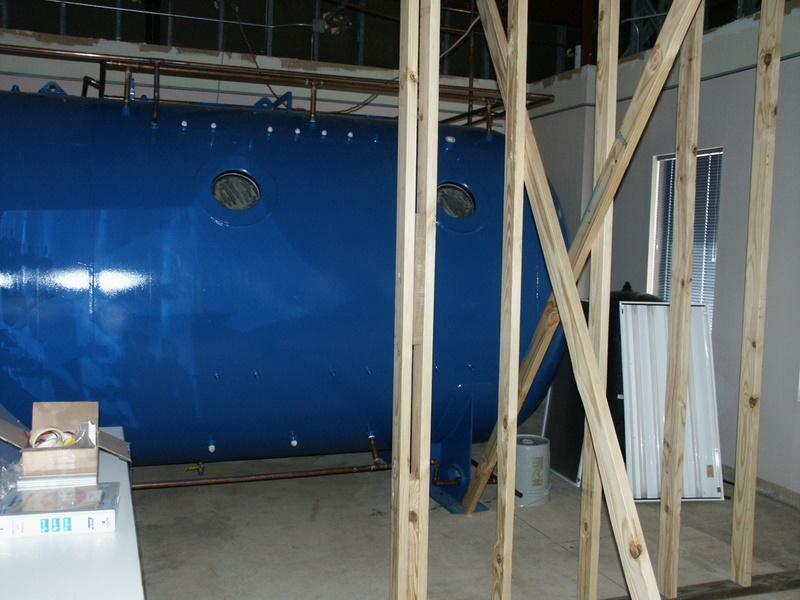 The Hyperbaric Chamber model BAH-6P is designed to treat 6 patients at one time. This chamber is brand new and has never been used. The Undersea and Hyperbaric Medical Society (UHMS) defines hyperbaric oxygen therapy as breathing 100% oxygen at pressures higher than atmospheric pressure in a hyperbaric chamber. 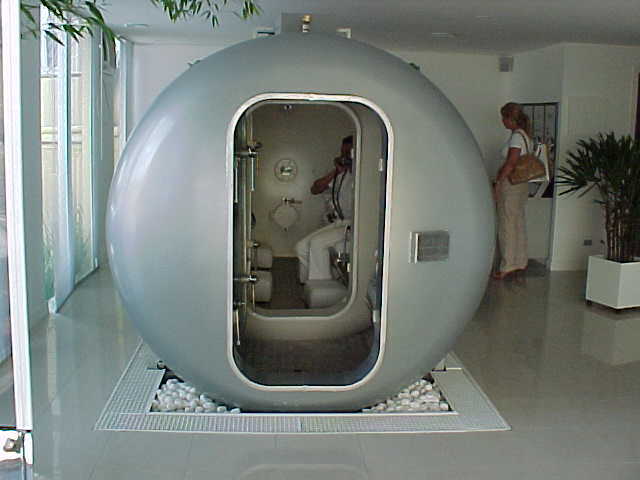 It is intended that this chamber be procured and used by physicians for treating conditions recognized by UHMS as indicated conditions for treatment with hyperbaric oxygen therapy. 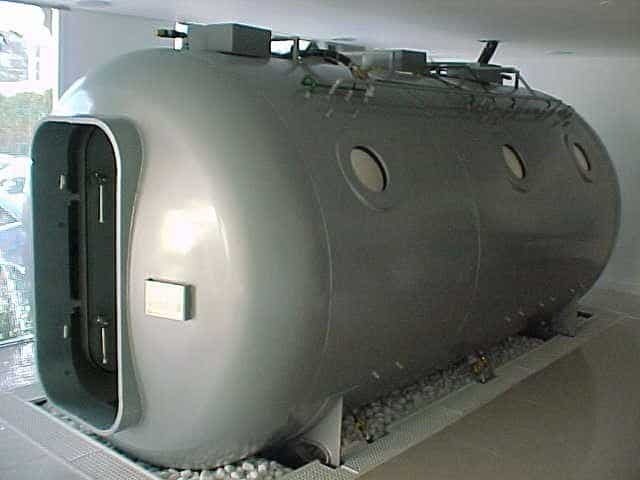 According to the National Fire Protection Association (NFPA), hyperbaric chambers are classified into two categories: Class A (multi-occupant) and Class B (single occupant). 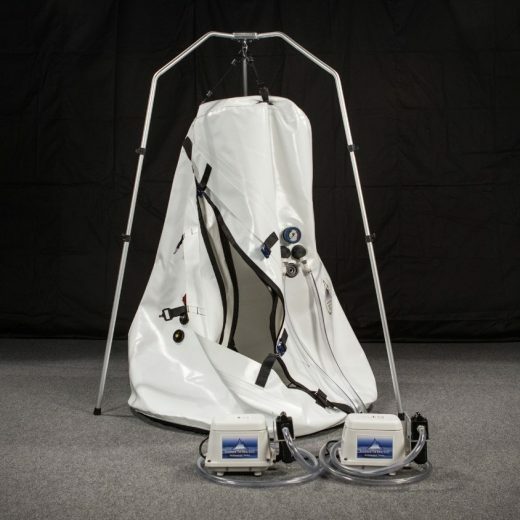 The model BAH-6P is a Class A chamber designed to treat patients up to a maximum operating pressure of 6 atmospheres absolute (6 ATA) or 73.5 pounds per square inch gauge. The chamber uses compressed medical air provided by medical air compressors as the pressurization gas and 100% medical breathing oxygen as the treatment gas. NFPA 99 – 1996, Standard For Health Care Facilities, Chapter 19 is the Recognized Consensus Standard for hyperbaric facilities. NFPA 99 – 2002, Chapter 20 is the later version of this standard. The chamber has two fire suppression systems – a deluge system that is manually operated from either inside or outside the chamber, and an independent hand line system located at both ends of the main chamber as well as in the transfer lock. In the event of an emergency a system of solenoid valves cuts off the 100% oxygen supply and opens a supply of medical air from pressurized cylinders for the patients. The hyperbaric chambers conform to all of the provisions of NFPA 99 –1996, Chapters 4 and 19 and NFPA 99-2002, Chapters 4 and 20. The American Society of Mechanical Engineers Boiler and Pressure Vessel Code, Section VIII, Division 1, ASME-PVHO-1-1997, Safety Standards for Pressure Vessels for Human Occupancy is the Recognized Consensus Standard for medical hyperbaric chambers. 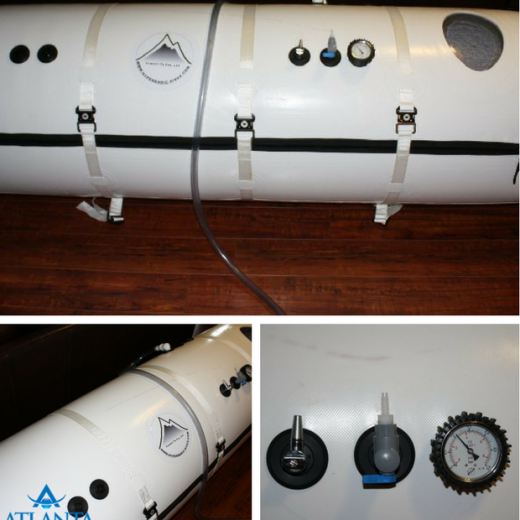 The BAH-6P hyperbaric chamber is designed, fabricated, tested and certified to meet all provisions of this standard. The BAH-6P has two rectangular doors that swing inward to permit the entrance of a patient gurney. In addition to the 6 patient seats, it has one additional seat for a medical technician or physician. The chamber has a transfer lock with two seats that is pressurized or depressurized independently from the main chamber so that patients or support personnel may enter or leave the main chamber while it is pressurized. Comfortable seats for ambulatory patients are provided along each side of the chamber that has a center aisle. If non-ambulatory patients are to be treated, the seat cushions may be removed and the stainless steel benches raised to the vertical position providing space for up to two patient gurneys. Each patient will breathe 100% medical grade breathing oxygen through an appropriate oral-nasal mask or head tent. A low voltage, low power intercommunication system for communication between persons in the chamber and the outside chamber operator is installed. A television camera for monitoring activities in the chamber in accordance with NFPA 99-2002, Chapter 20, is installed outside the chamber and views through an acrylic view port There is also a system to provide patients with audio programming from external sources such as television, DVD, videocassette, radio or CD. Internal oxygen and carbon dioxide levels are continually monitored with automatic alarm warnings using the Analox Sub MkIIF system with a REM 1 sensor system. It is the expressed, intended use of the hyperbaric series to provide therapy to those patients with selected medical conditions that have been determined to respond to the application of hyperbaric oxygen. As a Class II prescriptive device, it is further intended for physician involvement in its procurement and routine use. The UHMS is the professional medical organization chartered with setting the standards of care defining the appropriate use of hyperbaric oxygen. More specifically, the UHMS publishes a listing of medical conditions that have been clearly established as appropriate primary or adjunctive use of hyperbaric oxygen. The disorders on the list have been scientifically validated and verified through extensive data collection. It should be noted that the list is dynamic. Based on the strength of the scientific data, disorders are both added and removed from the list, depending on the outcomes of scientific pursuit. 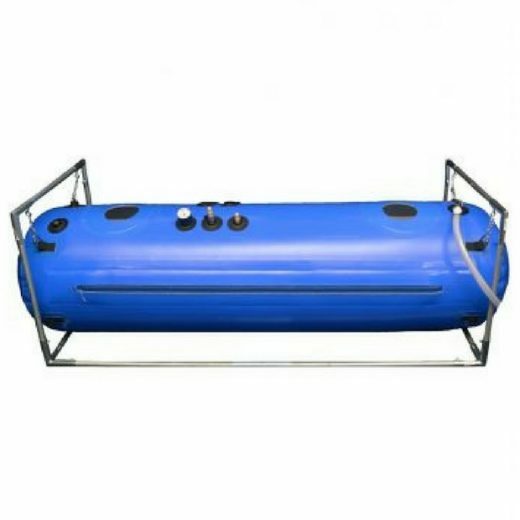 The hyperbaric chamber is designed to be installed and operated in medical facilities as defined by the NFPA 99-1996, Health Care Facilities, Chapter 19, Hyperbaric Facilities. Further, this system is intended to be operated only by medical personnel specifically trained in the appropriate use of hyperbaric oxygen therapy and the safe operation of the hyperbaric chamber and all related equipment. The B Hyperbaric BAH-6P is a 6-patient chamber. All chamber hull components are manufactured from ASTM A-560 Grade 60 steel. All penetrators are manufactured from ASTM A-479 type 304 stainless steel. All pipes are copper or ASTM A-479 type 304 stainless steel, and all valves and regulators are made of brass or ASTM A-479 type 304 stainless steel. All Hyperbaric chambers are certified to meet all applicable ASME and NFPA standards by our certifying agency, ABS Group Services do Brasil Ltda, the Brazilian subsidiary of the international consulting company ABS Consulting, Houston, Texas. All electrical equipment inside or attached to the chamber is low voltage equipment (less than 28 volts). There are no receptacles in the chamber. The pressurization and depressurization controls are located on the control panel, and are manually operated. Shipping, Set up and training are separate and buyers responsibility. AHC works with companies that will be more than happy to shipping, set up and training. Serious Inquires by Qualified Personal Only!